Your baby’s menus are customized by our Registered Dietitian based on your baby’s individual needs and development. Some of our menu items include the “classics” like “I yam what I yam” (roasted sweet potatoes), “There’s a pear in my food” (poached pears), “Plum crazy good” (ripe plums), Winner! Winner! Chicken Noodle Dinner! (roasted chicken breast, noodles, carrots and fresh parsley). We also have less conventional recipes like “Bean Me Up, Scotty” (savory black beans), “Quite Parsnipity” (herb roasted parsnips), “Loafin’ Around” (classic meatloaf) and “Green Eggs and Ham” (wilted spinach, fresh eggs and turkey ham). However, with our seasonal and creative approach to menu, from gnocchi to etouffee, our menus are limitless and sure to cultivate a foodie. Baby Foodie uses a staged approach to ensure proper introduction and portions for your baby’s development and age. Our stages act as building blocks, each stage provides the foundation for the next. We want to make feeding your baby easy and based on best practices. Our Registered Dietitian will plan and customize your baby’s menu, which is a feature loved by our parents. 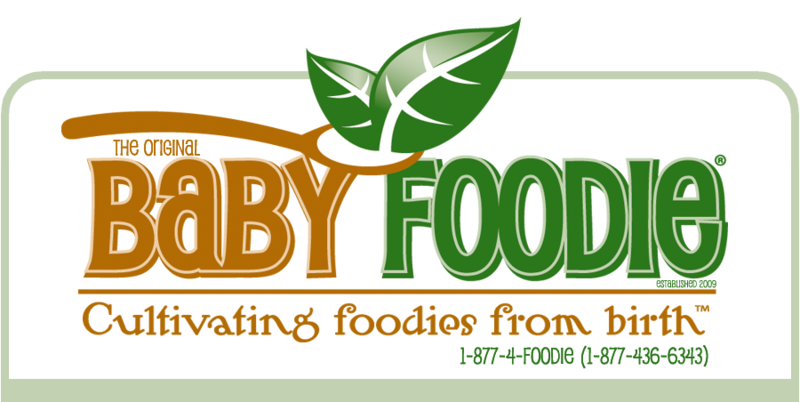 We are different from other baby food manufacturers in that we are here to manage your baby’s nutrition holistically. You do not have to worry about what foods are appropriate for what age or when to progress to the next stage. Our Registered Dietitian tracks and handles all of that for you, including any lifestyle or religious preferences. We package our food in 3 ounce portions, which is the perfect amount for babies. As your baby grows, we will increase the number of containers per day to meet your baby’s growing needs. We recommend you provide a variety of food groups at meal times to model healthy adult eating.